4Friends Games proudly presents a curious new adventure in their Edge of Reality series! As a baby, you were left on the steps of an orphanage with only one clue to your identity. Years later, that clue brings you to the door of the Azara Gambling House, where you agree to enter a secret tournament for only the luckiest of players. But instead of answers, you find yourself thrown into a dangerous and impossible game of skill! Will your luck hold out long enough to uncover the secrets of your past? Find out in this high-stakes Hidden Object Puzzle Adventure game! Play as Jane's father in the bonus chapter! Collect all the Joker's scepters and you shall be rewarded. Enjoy exclusive concept art, music, wallpapers and more! Edge of Reality: Fatal Luck Collector's Edition is rated 4.6 out of 5 by 52. Rated 5 out of 5 by Darklldo from This game is out of the box, and what a relief that is. So often I find the same game played in different scenes and by different characters, but still 'same horse, different track'. This game has the added sense of gambling and so all the games you play are spun around cards and roulette wheels etc. It does get tricky and I have to admit I got lost several times, so it's always handy having the hint button there. The HOGs were good and some of them a bit mind blowing due to the amount of items you had to seek amongst, but all of them attractive. Everyone else has covered it far better than I have so just take my word for it, it's a very enjoyable game. Rated 5 out of 5 by parkerki from Great Game This game had lots of new types of hidden games to play. Really enjoyed the story line. Refreshing to see something new! Rated 5 out of 5 by flutterbyz24 from Luck really is a lady I finally finished the entire game and the Bonus chapter. I thoroughly enjoyed the game and the storyline behind it. I personally didn't mind the helper dog since it really wasn't used a tremendous amount. The HOPS were well thought out and the puzzles were varied. I skipped a few puzzles after giving them a try (I often do this when I just don't feel like trying that hard). Overall this is one of the better CE's I've purchased lately. As always, try it for yourself. Some will love it; others will hate it. To each their own. Rated 5 out of 5 by LosAngeHell from Three Thumbs Up Three Thumbs Up! You know that is rare. Absolutely fun and different. The devs put a lot of thought and creativity into this one. After the game is complete, the mini-games just keep on giving entertainment. 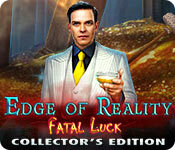 If you loved the prior Azara series, you will love Edge of Reality: Fatal Luck Collector's Edition. Rated 5 out of 5 by msaxinger from I really enjoyed this game This was one of my more favourite games I've played on Big Fish. Rated 5 out of 5 by CarriCat from Great Theme I loved this game because it felt new and refreshing. The casino theme and graphics were great. I liked the characters, and the little Corgi dog was so cute. I rarely replay HOP games, but this one I replayed because I liked it that much. I hope they do a series with this theme. It was so much better than the tired same old stuff. They put new mythology into this story and really made it interesting. Rated 5 out of 5 by kandikc from Take a Chance on this game I've been playing Hidden Object/Adventure games for about 10yr and I rarely do a review but this game is awesome enough for a review. I started playing this game and could not stop until I'd finished the main game. The HO's and puzzles were so much fun. The storyline was great. I also loved the corgi, he was so cute. Rated 5 out of 5 by ddlove03 from HIDDEN OBJECT FAN I just wanted to say that I absolutely loved this game. it was different. I would play this game again. I hope there will be more like this. Rated 5 out of 5 by gyanda from addictive! Don't play the trial - because you surely become addicted and then you want to buy this game in a minute!!! I guess, it has been years since i saw and played such a wonderful game. Everything is great, graphics, music and the gambling-scenery and how it is connected with the storyline is unique. What a treasure! Thanks, developers!!! Rated 5 out of 5 by lincslady from Wow! What a Game! This is more like it BFG! This game is one of the best I've played in a long time! I loved the graphics, the freedom of movement around the game, the different storyline, everything about it! It will most definitely stay on my Laptop to be played again and again, Lets have more of this! Rated 5 out of 5 by mysticSerpent from Super fun, sophisticated, and glam, which I loved You, the player, are Jane, who was left on the doorstep of an orphanage as a baby at the start of the game. Why? You have no idea. It is not until you enter the House of Azara, a super-swanky casino with chic, elaborately costumed croupiers, mob bosses, VIPs, and supernatural beings, that you begin to find answers. And once you start gambling in this casino, there is no turning back. I loved everything about this game: the gorgeous graphics, the HOPS, the characters (especially Clover the adorable Corgi and the joker/jester dolls), and especially the soundtrack. I have always had a sweet spot for games with great soundtracks, and I thought the music in this game was superb. Rated 5 out of 5 by timothya from The Joker Is You! BFG is on a roll of late. This one is really excellent, beautifully drawn, well acted, nicely plotted with a couple of twists and turns. Is that good guy really a bad guy? Is that bad guy really good? We won't know until the final roll of the dice. Pros: beautiful graphics, nicely colored and fantastic interiors. Atmospheric music. A nice mix of HO scenes and some of the puzzles were simply terrific. And a solid, coherent plot with plenty of revelations as a reward for completing scenes. The narrative is as solid as I've seen this year. And the ending is worth the effort to get there! Cons: minor. The difference in volume between cut scenes and the rest of the game was marked; suddenly the thing blasted from your speakers. One fairly significant one: if you don't get the Bonus game in the SE, (and I don't know that you don't because it hasn't been released yet) you'll miss the complete plot. No spoilers, so no more may be said. Also, the Corgi. As the now rather retrograde cutesy furry assistant this wasn't overdone in the main game but by the time the Bonus game was done I was ready to scream "Bad Dog! Go away!" In all, a brilliant game and a pleasure to play. The puzzles in particular were worth the price of admission. After a winter of magic-princess monotony this was a breath of fresh, spring air! Rated 5 out of 5 by fuzo from something wonderfully different I simply enjoyed this great gambling game. I never got to play a game like this before. Great style and design everything so clear nothing dark or blurry. I was so into the game that I didn't want it to end. I hope we'll get to play more games like this one. Only one problem the map was a little confusing to me. Otherwise a real entertainer. Enjoy. Rated 5 out of 5 by gobaba from Fresh and New At Last Based on main & bonus games Definitely not a "copy and paste" game, and thank you to 4Friends for that. I'm in that category of sick, sick, sick of fantasy and kidnapped princess games. I like the setting of a casino instead of some faux medieval kingdom. The music is subtle (especially if you turn the sound down like me) but appropo, scenery is colorful and chic, and thank you 4Friends for a fresh, novel storyline. Puzzle lovers will be very pleased because many are new and challenging. HOs vary to keep interest but traditional HO fans won't be disappointed. Adventure level is smooth, logical, and occasionally challenging. Collect joker's staffs throughout the game; warning-they are semi-transparent so look closely. Main game lasts about 4 hours in hard mode, and bonus game is rather brief at <1 hour. Bonus game is interesting and very creative. CE bling includes collectibles, achievements, replayable puzzles & HOs, plus the usual. Is it worth a CE? I'd say yes because even though the collectibles are nothing new, the bonus game was so well done. Really, the fresh approach to story, puzzles, scenery, and cute little corgi helper make this game a pleasure in a long dry spell of me-too CEs. Rated 5 out of 5 by greenshade from Game plus bonus What a stellar game from 4 Friends. A new story line and excellent game play. The HOs were very interactive list types. I am one who usually ends up skipping most puzzles but these were fun and was able to successfully complete 3/4 of them. Bonus chapter was a good length and also fun. Thanks 4 Friends!! Rated 5 out of 5 by dancemom1 from How lucky are you? Hello friends! As usual, I review mostly on the game play and leave the story line to others who do a much better job than I. We have #3 in this series. Graphics are very well done, very clear and I did not notice any blurring when going in and out of close ups. Colors are very nice and true, even with a bit of blue here and there. Game play was quite good, with no glitches during the demo. Animation is well done, with realistic mouth and eye movement and smooth body movements as well. Voices were well done and were age and character appropriate. We have a lot of character interaction in this addition, which makes a game seem more realistic and not just a walk through. You can click through dialog if you read faster than they speak, without missing a clue or a needed item. We have a poker chip that we use to find hidden symbols. Not one of my favorite type of games, but at least it isn't a lot. Music is not bad at all and moves with whatever is happening at the time. Sound FX are very well done and realistic. I did not notice any quiet or "dead air" during the demo. HOPs are nothing but interactive lists, at least during the demo. Scenes were fairly clean and clear and items were not difficult to find. I did not see that you could switch to something else if you got bored with the same thing all the time. Puzzles were quite challenging and mostly different than what we are used to having. Didn't really breeze through any of them! Extremely well done. The map shows where a collectible was missed. Hint system is helpful, but did not transport to longer locations during the demo. For some reason, we just don't get much in the way of good collectibles in this series. We only had joker scepters, which were large enough to see, even though they were almost see-through. There was no real challenge to finding them at all. A bar off to the left tells you how many you need to find in each scene, most of the time, it is two. Would have been nice to see some morphing objects here and there. We do collect 6 card with various powers that help us throughout the game, e.g., strength. This series just seems to get better with each addition. It's not a continuation of a previous game, it is an entirely different story...how refreshing. The story was interesting and you were constantly on the move doing something throughout the demo. It flowed very nicely and I was disappointed when it ended. The only thing I did not care for was the scrolling scene, but not every scene does it. I think most levels of players would find this one challenging and interesting. Yes, I will definitely add this one to my collection. When I beta tested this one, I gave it a 4.75...staying with that. Very nice game! As always, try it for yourself and see what you think. We all have different tastes in games and you may not care for this one at all. Thanks for the reviews. Play on! Rated 5 out of 5 by Majestyx12 from Gambling Dimension is it a Gambler's Paradise? Based on the completed game and bonus material. I Love this game. I really love the makers too. It's a story about Supernatural gambling with a father, daughter and their Corgi Dog. The Corgi dog named Clover helps with some out of the way places and is loveable and quiet. I was very pleased with the Hops. 20 in the game. 14 in the main game and 6 in the bonus chapter. They had some repeats of the hops scenes in the bonus. I didn't mind. I thought they are well done. You collect 50 Joker's Scepters. If you collect all of them, you unlock a special bonus. I thought they were hard to find, but findable. Mostly 2 per scene in the main game and 1 per scene in the bonus chapter. I panicked at the end because I was so careful and checked often to make sure I got all of them. I had 49 out of 50. I went to the collectible tab in the bonus content and figured out the last one. I got my special bonus equaling 36. I don't want to spoil the surprise. The bonus chapter continues the story where it left off. You will met Fortuna. I liked it and I didn't think it was short. * I counted all the bonus content twice- You have 35 movies, 11 hops, 5 music, 14 mini-games, 4 screensavers, 6 wallpapers, 15 concept art. Achievements were very obtainable. 45 page guide, 3 chapters + bonus chapter. Try it for yourself. Rated 5 out of 5 by Marja67 from Finally a Really Good Game. Love this one. Pretty graphics. Good story and music. Handsome characters and lips move with their talking. Fun casino games to play. Collect scepters in the scenes. Comes with a strategy guide if you get lost. A definite buy. Rated 5 out of 5 by pennmom36 from LET THE GAMES BEGIN! Abandoned at the doorstep of the orphanage when she was just a baby, Jane had only a few clues to search for her father, a casino chip from The House of Azara, and a torn card. Strangely, the Azara casino has re-opened its doors for the first time in 25 years, and Jane knows this is the time to search for answers. The answers don't come easily, however, when Jane realizes she's just entered a life or death tournament. Will this bet pay off, or pay out? This is a fantastic game with a really cool and somewhat original storyline, but it is similar to Deck of Fates. There is a gimmicky Casino Lens feature where you scan the room for unseeable objects the naked eye can't see. I could do without that feature, but it's not too intrusive, There's another gimmicky feature of Cards that somehow give you special powers such as strength. You get the cards from the poor unfortunate players that lost the game, and each card is related to their personality traits. Your sidekick is an adorable Corgi and I kinda liked him! There are 50 Hidden Joker's Scepters to find in this CE version, usually two per scene. 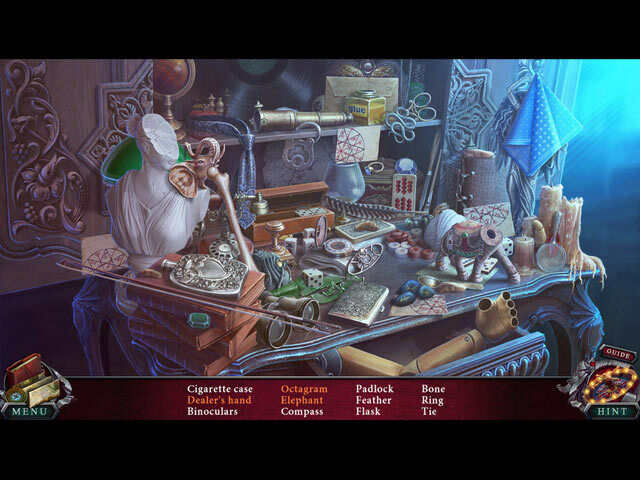 The Hidden Object Scenes are mostly Interactive List finds, but they are located in interesting places and the objects are well blended. There are also Keywords in sentence finds and technically the Casino Chip lens games are more of a HOP than a mini-game puzzle. There are no alternative games offered. The Mini-Games are creative, unique, and most are downright fun, however, they are all gambling-related with cards, dice and casino chips, so if you don't like gambling, even virtually, you may want to pass on this game. Below are brief descriptions of some of the games you'll encounter during the demo: 1) Slide cards to correct slots by dragging them along tracks. 2) Drag lines through matching symbols to remove all tiles. 3) Drag tokens to correct slots. 4) Use directional arrows to place all 4 tokens in the middle. 5) Scan room with Casino Chip to find symbols shown. 6) Rotate and place dominoes to match values on the board. 7) Adjust levers to complete the image. 8) Choose sturdy rope segments, niches & crystals to climb. 9) Choose any dice to fill 4 slots before your opponent. 10) Reach a score of 20 or higher to beat the dealer. This Collector's Edition Version has 6 Wallpapers, 15 Concept Art pictures, 4 Screensavers, 6 Music Soundtracks, 35 Movie Cutscene Videos, 11 re-playable Hidden Object Scenes, 14 re-playable Mini-Games, 15 Achievements to earn, 50 Hidden Joker's Scepters, 3 Main Chapters + Bonus Chapter and a built-in Strategy Guide, enjoy! EDGE OF REALITY GAMES AVAILABLE Title Collector's Edition Release Date Average Rating 1-Ring of Destiny (April 28-2016) 3.8 2-Lethal Predictions (February 4-2017) 3.6 3-Fatal Luck (April 19-2018) n/a by 4Friends Games Edge of Reality, Living Legends, Bridge To Another World, Immortal Love, Dark City. Rated 5 out of 5 by Ndwelt from Simply Amazing Can't say anything but GREAT about this game. Every other reviewer has gotten this right! 4 Friends, you are now the King of The Hill when it comes to creativity. The storyline is fresh and addicting. Kinda supernatural without All the various demons! YaY! All I needed was one scene and I was hooked. Best yet this year. Even at full price worth every penny! Enjoy, be immersed, but come up for air before it's over too quickly! Rated 5 out of 5 by LogieBaby from After months of repetition we finally have a game with some originality I now approach every new game with some trepidation since almost all have rehashed stories. Available to us are a plethora of haunted houses, creaky mansions, cemetaries etc. that house demons, fairies, damsels in distress, etc. and almost always a female main character that must save if not the entire world as we know it but at least the day. Much to my surprise Fatal Luck rises above the ordinary and succeeds somewhat in providing a much needed twist insofar as the story evolves. The innovation is GAMBLING. There have been some other games where trying ones luck has some elements in them. I cannot recall any game where GAMBLING is the essential plot theme and it is indeed welcome as a novel plot. We have dice games and cards during the demo and I am sure other games of chance are in the offing as Edge of Reality evolves. The story offers nothing new in the fact that the main character is tasked with saving someone and I'm OK with that since the means to the end ( GAMBLING ) is new. The HO segments are quite interactive and lots of to be found items are cleverly hidden. There is an interesting maze puzzle during the demo while other puzzles are of the ilk often seen in HOPA. There are jester scepters to collect and we do have an animal helper, a rather cute Corgi. I generally detest assistants in games but this pooch sort of grew on me. I guess players with an aversion to gambling will shun Fatal Luck. Those of us who occasionally relish rolling "dem bones " or a seat at a card table or even just sitting at a one-armed bandit should find this game very interesting. Kudos to 4 Friends for introducing originality in this game as we all know there is generally a dearth of so-called new games. A HEARTY recommendation to Fatal Luck. Rated 5 out of 5 by bmn5772 from HAD TO HAVE THIS GAME I loved this game from the start.....especially since I live in a gambling mecca...........the graphics are pleasing and the story line is superb. Rated 5 out of 5 by 1955raven from THE STAKES ARE HIGH!! IN THIS DANGEROUS GAME OF LUCK! I FOR ONE FEEL LUCKY, FOUR FRIENDS HAS CAME THUR AGAIN WITH ANOTHER GREAT GAME!!! Rated 5 out of 5 by sunnyglow from ROLL THE DICE - ODDS ARE THAT THIS IS ONE OF THE BEST GAMES OF THE YEAR! REVIEW BASED UPON THE ENTIRE GAME MINUS THE BONUS CHAPTER 3 Chapters Plus a Bonus Chapter – Strategy Guide: 45 Pages – Time: 4 Hours OVERVIEW/BACKGROUND: Hello Sunshine! Get ready to participate in a winner-take-all tournament. Just remember to don your mask and cloak and follow all the rules! Failure to do so will result in your “final” elimination! Nevertheless, winning will result in the fulfillment of your fondest wish. However, by the end of this game, your fondest wish may be to never see a casino again! Return to the 1920’s. As an infant you were left at an orphanage with a torn picture, a poker chip and a burned card with the word “Azara.” Now, searching for clues concerning your parents, find yourself in this tournament at the newly constructed Azara hotel. You will compete against six (6) fellow competitors. Hopefully you will learn something about your parentage and hopefully, you will survive this tournament! OPINION: I LOVE this game, although it is short with a part-time helper. I purchased it immediately. In my opinion, 4 Friends is upping the quality of their games. 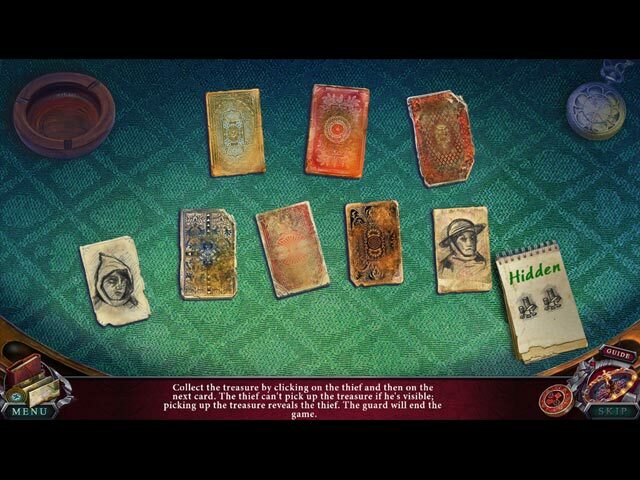 This game should appeal to those who love casino-style games (which constitute most of the puzzles) and those who love mysteries. 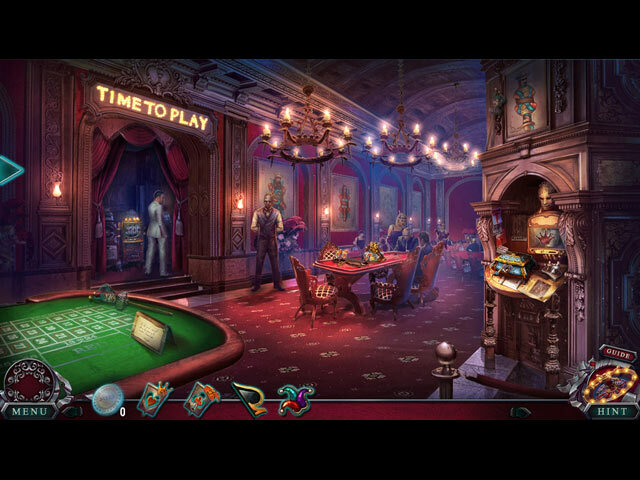 The graphics are full of bright lights – displaying a colorful casino-style environment. Think – Vegas, baby! The game is well-constructed with most of the activities related to gambling. The pace is excellent with many of the puzzles based on casino games. MECHANICS: You collect fifty (50) jokers which, when you have collected enough of them, add a player to a card game. There is a sidebar which indicates if there is a joker within the scene. I found most of the jokers easy to locate. You will also be collecting six cards which give you powers you can use throughout the game – strength, sensing gold, mechanical strength, illusion shattering, impersonation, and a joker. There are fifteen (15) achievements you can earn along with seven (7) wallpapers, concept art, and music. You can replay eleven (11) HOP scenes and fourteen (14) mini-games. CLOVER THE RUNAWAY HELPER: You will have a part-time helper in this game, a small, doe-eyed dog. This little pooch will help you and then disappear only to reappear again in the game. He is not used often in the game and he “helps” you quickly. Although I hate helpers, he was tolerable within this game. He does not sit at the side of the inventory bar no does he bark. BONUS CHAPTER: It is a sequel to the game. In this chapter you will need to save someone dear to you. To state more would give away too much about this game. It is a continuation of this game. I feel you would need to purchase the CE version or you could be left hanging if you purchase the SE. I did not complete the bonus chapter; however, it appears to be of decent length. HOP SCENES: There are fourteen (14) within the main game. They are thematic; however, most are straight lists of items. Only the first scene displays any creativity. There is one scene repeated within this game. The HOP scenes are my biggest disappointment. With this theme, I feel more could have been done with the scenes. They are not considered HOP scenes; however, there are scenes in which you must use a magic lens to locate hidden objects within a scene. PUZZLES: I LOVE the puzzles in this game. In the main game there are twenty (20) puzzles. All the creativity within this game lies with the puzzles. The puzzles fit nicely with the casino theme of the game. They vary in style and difficulty. There are a couple of difficult puzzles within this game. Play puzzles which deal with cards, dice, slot machines, and dominoes. They are well-crafted games and in many you will have to beat the computer. I purchased this game for the puzzles and want to replay some of these. Just exquisite! SPOILER: HERE ARE SOME OF MY FAVORITES AFTER THE DEMO: A. Connection puzzle. Connect lines between cards so that the lines emanating from the card matches that on the card. B. Tangram puzzle. Place pieces into position to create an image. Place the pieces so there are no spaces within the grid to create this image. C. Mathematical puzzle. Arrange billiard balls within two circles so that the total of any two of the balls equals one centered between the two. Difficult. You can switch out the numbered five extra balls. D. Blackjack! Place cards faceup and try to get 21 to remove the cards. You must find this combination six (6) times in the scene. E. Cube puzzle. Pull on arrows on a cube with colored pegs extending from them. Pull on the arrows until all the pegs match up with the background. Difficult. F. Hit the jackpot! Slot machine. Move the handle and try to get the same token across the screen. You can hold symbols for one turn of the slots. G. Assembly puzzle. Swap the corners of torn cards to create complete the cards. Cards are face down. Cards rotate as you try to restore them. Somewhat difficult. Rated 4 out of 5 by WPLUBEGIRL from Not quite a 5 star I started out liking this game but all of the scenes started looking the same to me. Graphics were good and I personally love little helpers ,especially dogs. however, I guess maybe I'm just getting bored with all of the stupid floating city, unrealistic, same looking scenes. I like variety with realistic story lines that take us outdoors and traveling to different towns par exemple. What happened to top quality games like Nevertales, Beauty Within and Cadenza, Music, Betrayal and Death? These were games with a hint of the supernatural but with a believable edge. Most game players of this genre are middle age like myself and are really sick of the " way out there" hard to follow games. Thus being said, this game deserves at least a 4 and a half star review for their unique story line, good graphics and interactive hidden object scenes. Rated 4 out of 5 by wildweasel from Voice of Dissension Voice of Dissension; not really, but then there was just something about this game that I just didn't like. I think it was the art; it had a dark theme, to me. That and I'm not into gambling, of any kind. I didn't like the Map either; to me, an essential part of a "Collector's Edition". Don't get me wrong; the gameplay was good. I will recommend this game because not everyone is going to let the art and theme affect their like or dislike of the game. The sound was great the graphics good, not great, but really good and gameplay was good. I haven't played the Bonus Chapter yet, let's see how I like that. Rated 4 out of 5 by Kimmycoo from Unique Its nice to see some unique storyline. I get tired of green and purple wisps..Id like to see more real people in real situations. Though this has its own magic it was good enough to impress me. I loved the artistry. I liked collecting the scepters but even though Id thought I had them all, one came up missing, even though I followed along with the guide.